District 2 Board of Education Republican candidates Traci Fuller (L) and Roy Rabold. Photo/Ben Nelms. 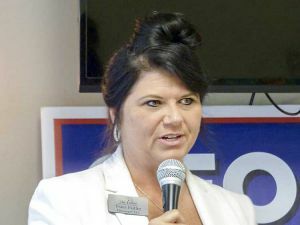 The two Republican candidates for the District 2 seat on the Fayette County Board of Education faced off on April 30 at the Fayette County Republican Party event center in Fayetteville, responding to prepared questions and those from the audience. 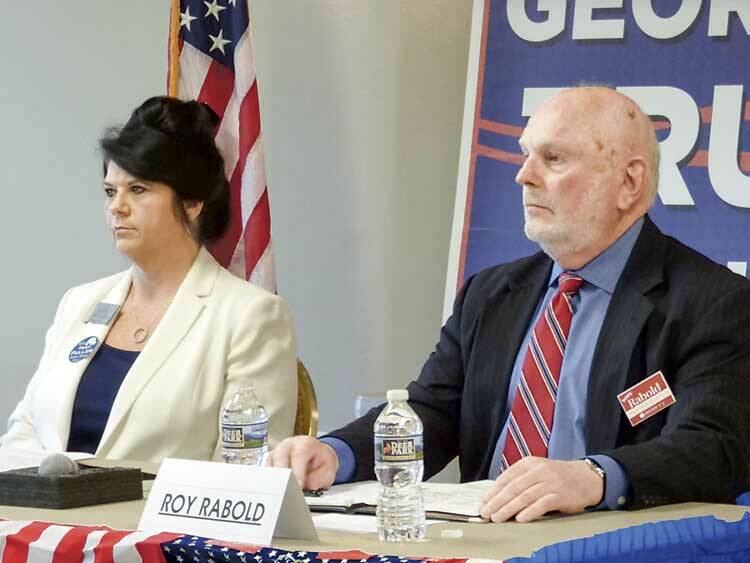 In the running on the Republican ticket are insurance company owner and real estate agent Traci Fuller and 30-year school administrator Roy Rabold, who served as principal at Whitewater and Sandy Creek high schools. The candidates at the outset were asked to identify core areas within the school system that could be improved upon. Fuller cited three items. Those included safety, providing increased career pathways and ensuring that students are receiving the counseling they need. She noted that significant progress has been made in the safety and career pathways, adding that there is more work to accomplish. 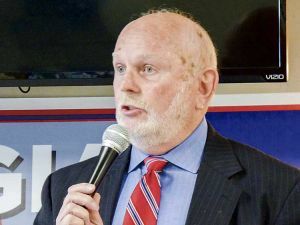 Rabold in his response cited two areas for improvement. Those included safety and equity in education. Rabold, too, said the school system continues to find ways to enhance school safety. Pertaining to educational parity, Rabold said some parents noted discrepancies when comparing schools. He said the school system hired instructional, school-specific coaches to help address parental concerns. The candidates in another question responded to the perception that some schools are “not as good” as others. He said the school board must work to provide what is needed to make all schools successful, support the superintendent’s requests and get test scores up. Fuller in her response said, “I don’t believe we have that many discrepancies in the school system. I don’t believe one school is favored over another.” Fuller added that one way to address the perception is to enlist the assistance of Realtors as a type of first-responder for the community. “Realtors are in the front lines. We hear it,” she said, noting that families moving into or out of Fayette will share their desires and experiences. She said Realtors can advocate for schools and can address the misconception that one school is better than another. An audience question asked what specific administrative structural changes are needed at the school system’s central office. Fuller said it is a misconception that a lot of dollars are allocated at central office. She said many of the central office staff or carrying two or three job titles. “I think some need fewer hats to wear,” said Fuller. Rabold responding to the question said teachers have the most impact on students and principals have the most impact on teachers, adding that he wanted to see fewer staff in central office and more teachers in the classroom. 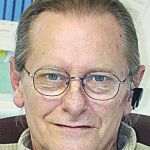 “A lot of time central office people create work that is not needed in schools and classes,” Rabold said. The winner of the Republican primary will face Democrat Sara Van Etten in November. The school board’s District 2 encompasses portions of Fayetteville, east central Fayette County and all of south Fayette.